During 2010 the Board began a project to beautify the entryway into the District off Parker Road. 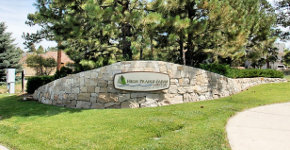 The Board worked with a landscaper and artist to create an entryway that included the beautiful bronze deer sculpture. The project also included native, low-maintenance plants that are indigenous to Colorado and require less water. Architectural lighting was used to enhance the impact of the entryway at night. During the holiday season, the District installs holiday lighting and ornamentation to welcome both visitors and residents. Landscape improvements were also added to the corners of the entryways into the subdivisions from Pinery Parkway. These improvements included rock walls, signage, trees, perennial plantings and decorative mulching as well as sidewalk extensions and handicap-accessible ramps.